← Top 10 Coastal Ice Moderates, Part 1. When my alarm went off at 7 am on tuesday, I turned it off, slept for a few more hours, and then went bouldering. On wednesday, I rolled out of bed at the slightly more humane hour of 8:15 and, after writing a note describing where I was going (I recently watched 127 Hours) and stopping for coffee, left the trailhead in Lion’s Bay by 9. 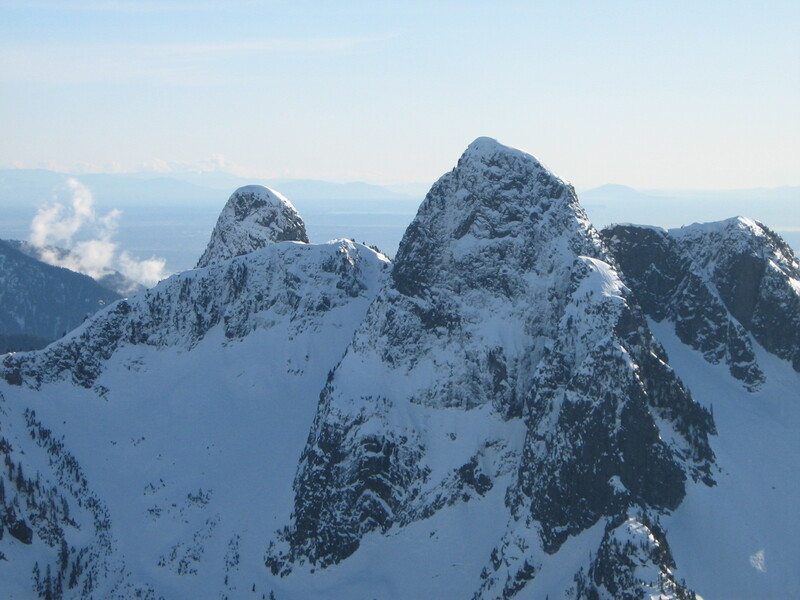 Looking north to the East and West Lions from the summit of Mt. Harvey. I passed beneath the imposing north side of the West Lion where the year before I had climbed the Northeast Buttress. It’s the most aesthetic feature on an iconic local peak (it’s the buttress dropping left from the summit in the above photo) and in good winter conditions it’s relatively moderate. Last year I’d approached it alone with a certain amount of trepidation only to find straightforward climbing on styrofoam-like snow and rime ice from bottom to top. In fact, down-climbing the “tourist route” on the south side was quite possibly the most challenging part of the day. The climb had taken me five and a half hours from car to car and I had no reason suspect that things would be different on the Southeast Gulley. Classic North Shore alpinism on the Northeast Buttress of the West Lion. Someone has kindly trimmed a path through the shrubbery. In spite of a few sections like this, the Northeast Buttress is actually an excellent route. 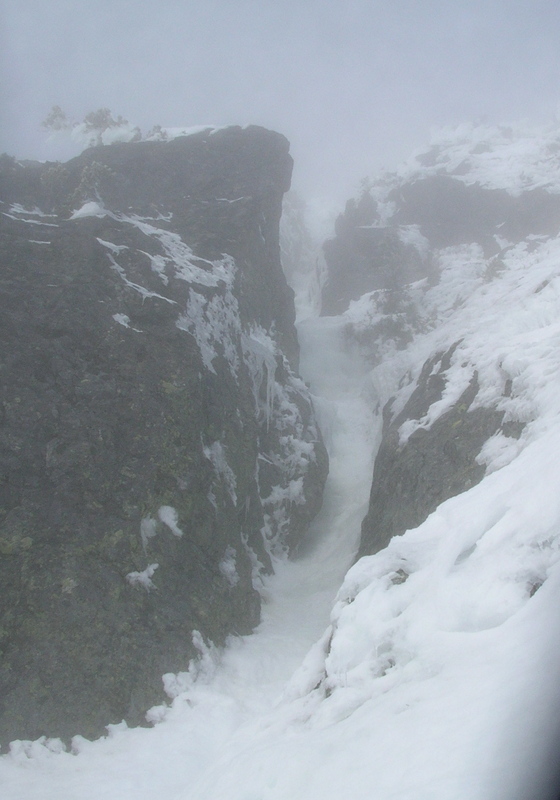 The slope below the East Face felt like a serious place; there were bulbous cornices overhanging the ridge on the left while on the right, bits of rime ice were tinkling down the wall. 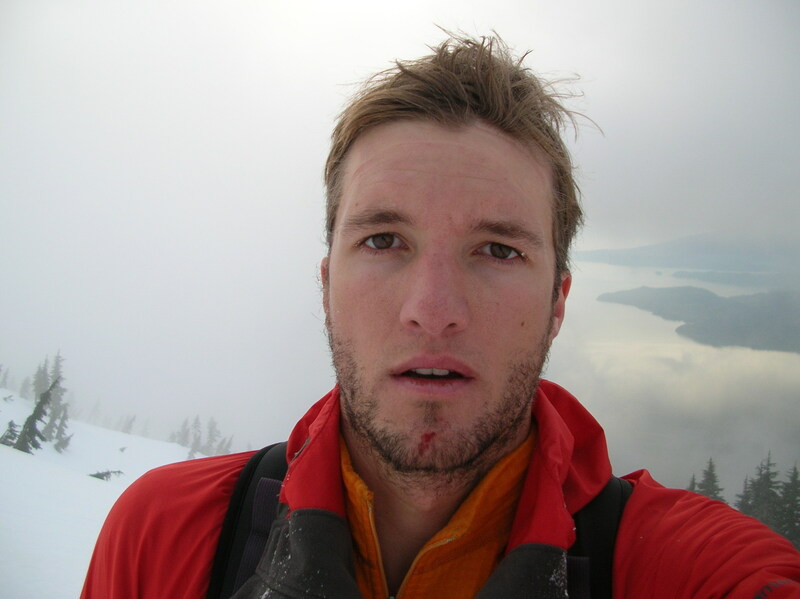 I picked a line up the middle and did my best Ueli Steck impersonation. This lasted for approximately two minutes, at which point the lactic acid building up in my legs became unbearable and I settled into a more reasonable pace. There was a cloud hugging the south side of the mountain when I arrived at the col below the route. I couldn’t see much, but it didn’t look too threatening and I rationalized that it was preventing the snow and ice from becoming too sun-affected. Looking up from the base of the Southeast Gulley. 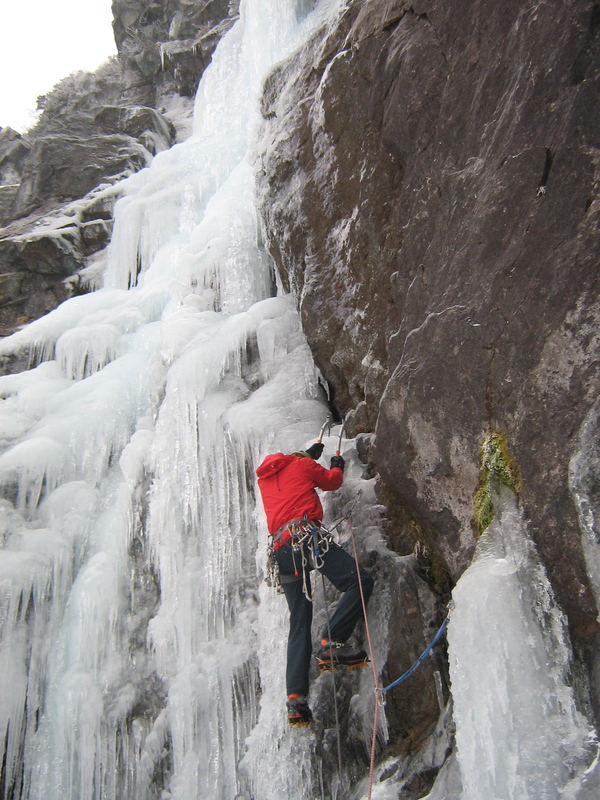 The climbing was mostly on low-angled ice. Unfortunately, it was of disconcertingly poor quality in places and I found it necessary to climb very slowly and carefully. I had brought a six millimeter rope that I had intended to use mainly on the descent. However, when I came across a good in-situ piton just before what appeared to be the last steep bulge of ice, I decided to give myself a quick self-belay. In spite of the poor quality of the ice, I was soon on the steep snow slope above, getting ready to pull my rope up behind me. I dropped one end and began to pull: smoothly at first until suddenly – nothing. It wouldn’t budge. I was in a mildly precarious position on a steep and not particularly well-consolidated slope and the remaining rope wouldn’t reach to any potential anchors. I am very strongly against leaving garbage in the mountains (even if this wouldn’t be the first “fixed” rope on the West Lion) but the prospect of down-climbing to free it was highly unappealing and ultimately my sense of self-preservation won out (if I can’t convince someone to do the route and “booty” it, I will try to go back soon and get it myself). Unfortunately, after dropping the rope I was not home free. There remained one difficult section barring access to the summit. Climbing directly up the gulley appeared to involve loose rock and delaminating ice so I initially attempted to climb out left through some shrubbery. Not being particularly excited by the prospect of testing the tensile strength of frozen twigs, I retreated and went to have a look out right. 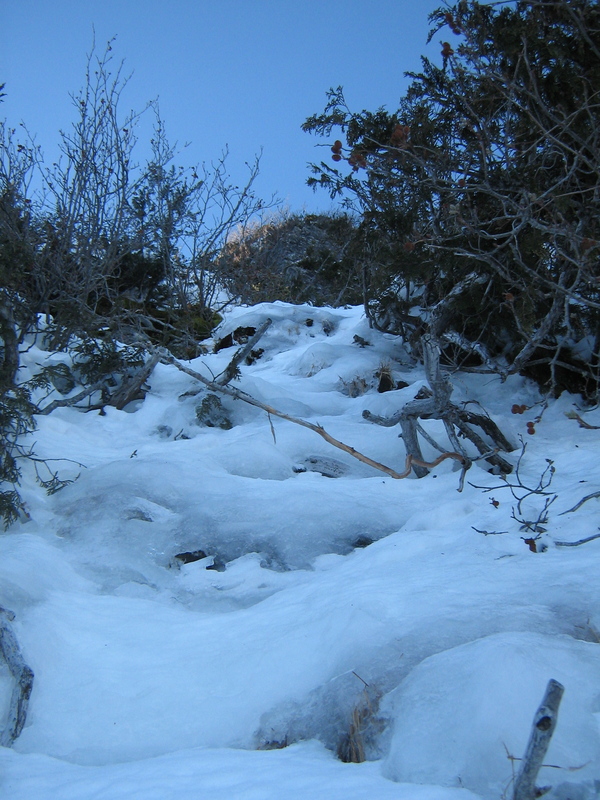 At first this proved encouraging as the snow and ice were firmer and more secure. I was nearly onto easier ground when I was blocked by a short overhang formed by a mushroom of rime ice. There was a tiny ledge under the bulge and I sat there for a moment and wished I was bouldering. Tony McLane on This Monkey's Gone to Heaven, taken the day before. I hacked away at the rime to eventually expose some sturdy tree branches (in spite of the rime, I clearly wasn’t in Patagonia). The moves didn’t look difficult, but the tug of the East Face, hidden in cloud and dropping steeply beneath my heels, was enough to give me pause. It was while wishing that I still had my rope that I remembered that I had five meters of cord in my pack. I tied it to the highest, sturdiest branch I could excavate, clipped myself to it, and made a series of mantles through the ice-encrusted bushes. I arrived at the summit perhaps not in the best mood to fully appreciate the beauty of the fact that the summit was an island just barely poking out above an ocean of clouds. I was reassured to know that I had down-climbed the standard route the previous winter. Thankfully, this time around the snow conditions were superb. Unfortunately, I was inside of a cloud, and with the summer trail and fixed ropes buried under snow, there weren’t exactly a plethora of identifiable landmarks to aid me in finding the easiest route down. Patience is an alpine climbing virtue of which I am in short supply. Every time that I down-climbed into a dead-end, I had to remind myself that there was no rush and that I would get down eventually so long as I didn’t do anything foolish. As it turned out, I had to remind myself this at least a dozen times before I managed to piece together the route down into the notch. The hike out was comparatively uneventful. Just as I was beginning to question whether or not I was on track, I broke out below the clouds and could see exactly where to go. New haircut, courtesy of Karina. Hiking down to my car, I felt a little upset with myself for having made a number of mistakes throughout the day. 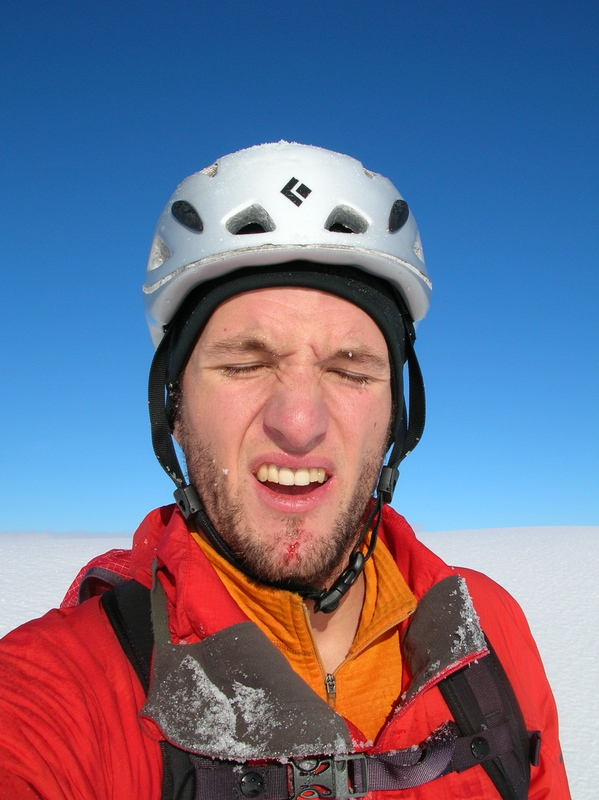 I like things to go as smoothly as possible in the mountains. I like a minimum of uncertainty. In retrospect, I realize that getting the rope stuck was partly an inherent risk of the system I was using and partly just bad luck; I had kept it very neat and kink-free and there wasn’t anything obvious for it to get hung-up on. With the rope, the rest of the climb and the descent would have been much smoother. I was never in a particularly dangerous position and I even made it back to the car before dark. 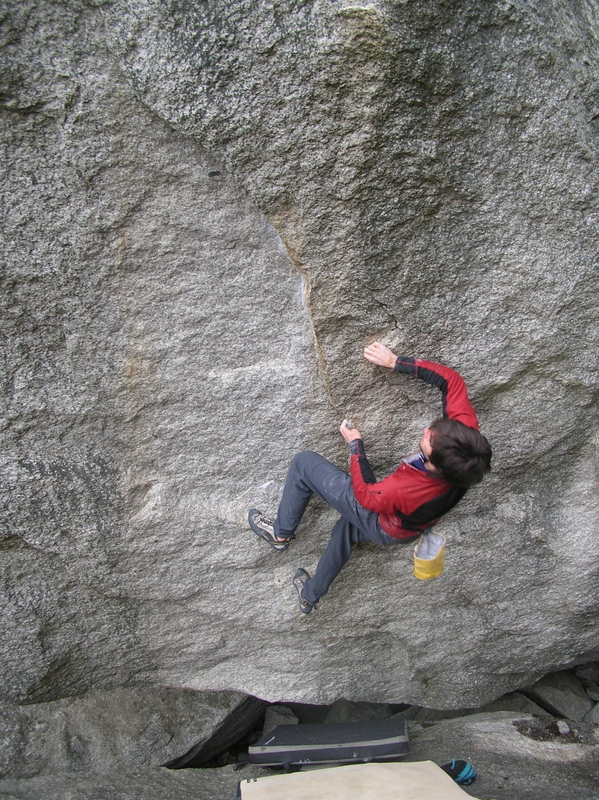 Ultimately, if I really wanted to minimize the uncertainty in climbing, I should have slept in and gone bouldering. Paul Backhouse climbing ice beneath the North Face of the West Lion in Dec. 09. This was the leftmost of the longer routes on the wall. It was 150 meters long and maybe WI4ish. Possibly the route "Advertising Agents in Space" but who knows; there's a lot of ice up there in the right conditions. I was wondering, can you access the start of the route easily from the South side (past the standard route), rather than traversing below the NW buttress, if avy conditions aren’t optimal? I noticed you mentioned “the col below the route” which made me think of the large col (with the large ridge) between the east and west lions. I think the approach that you’re talking about would be reasonable and probably more sensible if you didn’t have bomber snow. The route starts just a bit left of the col in the ridge that joins the east and west Lions. This is the best photo I could find online. If you happen to see my tag line, feel free to booty it. Otherwise, I could trade some beers for its safe return.